1. Mix oil, rosemary, salt, pepper and garlic together. 2. 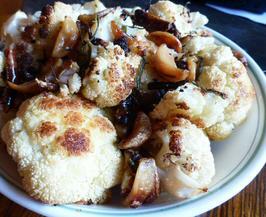 Toss in cauliflower and place in a large casserole dish in one layer. 3. Roast in a preheated oven at 450 degrees for 20 minutes; give a toss and bake for 10 more minutes.